One device to change everything. Forever. Setting up Sounder Pulse is as easy as 1, 2, 3. Plug Soundstr Pulse into power and audio, connect to wifi and set the audio levels. Soundstr Pulse is equipped with XLR input/outputs to connect directly to a soundboard or audio receiver ensuring optimal music recognition conditions. Soundstr Pulse is backed by Gracenote’s best-in-class music recognition technology. Gracenote maintains the world’s largest music library. Soundstr Pulse includes a backup battery and can even continue to identify music without an internet connection. Each Soundstr Pulse is equipped with Bluetooth Low Energy (BLE). This gives advertisers the ability to interact with patrons and businesses to make more money from advertisers. 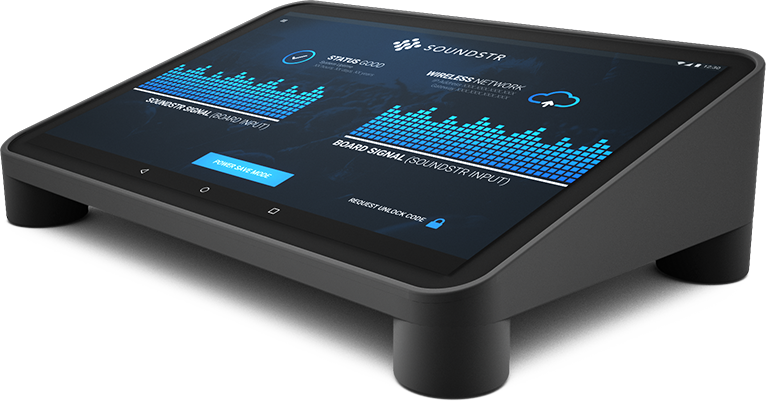 Soundstr Pulse uses User Authenticated data transmission. Rest assured knowing the performances originate from a specific device. Soundstr Ad connects brands to consumers at live music events like never before. We use the power of data to help align you with highly engaged audiences. Soundstr ID helps businesses pay fairer music license fees based on actual music usage, and make more money through a patent-pending advertising system. Our data can help you route tours, promote upcoming releases and discover the places playing your music – allowing you to find your fans in real life. Soundstr can help performing rights organizations accurately pay songwriters when their songs are played in licensed businesses.